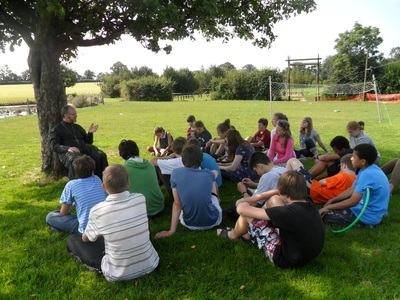 The camp is run by a team of dedicated staff members, most of whom have been involved with the Diocesan church camp for decades - first as campers, and then as helpers in various roles. ​The camp chaplain and head is Archpriest Stephen Platt, who is also the Head of the Diocesan Department for Youth Work. He and his wife, Anna have been helping at the church camp for over 15 years, and their five children are all campers or leaders, in most cases attending the camp since infancy. As well as the main team of camp helpers comprising the chaplain, the cooks, the religious instruction and arts & crafts teachers and the nurse, St Seraphim Camp benefits from the dedicated work of its youth leaders. These are a group of Orthodox young people of student age - in most cases former campers themselves - who plan and supervise day-to day activities. The campers themselves are organised into tent groups according to gender and age, each tent led by the resident tent leader. Encouraged and helped by their tent leader, the children tidy their tents, carry out their share of common chores, but also play together, perform sketches and join in with all the other activities on offer. 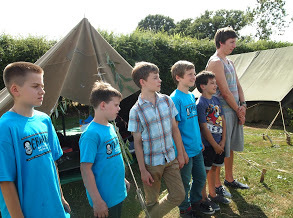 The tent leaders are also the first post of call in case of home sickness or other problems. Most of the camp leaders are former campers themselves, so are well equipped to advise their charges. All our staff undergo statutory disclosure checks.